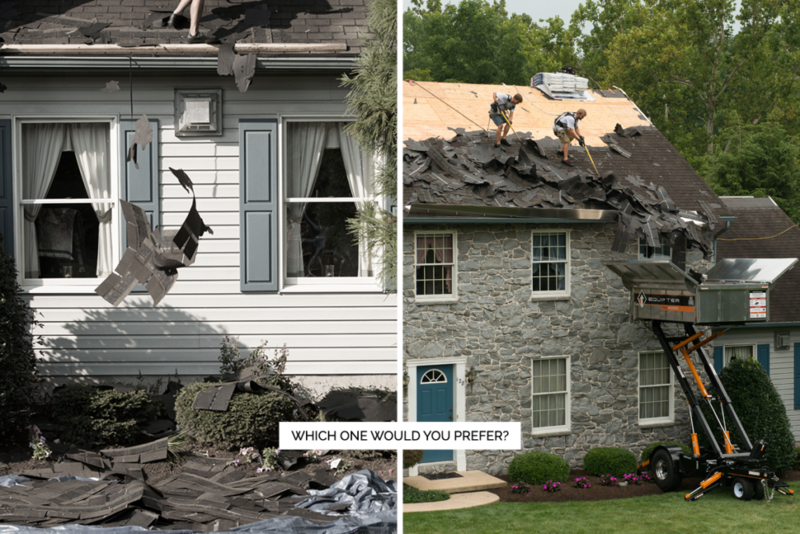 All too often, roof problems are discovered after leaking or other serious damage occurs. Periodic (twice-a-year) inspections can often uncover cracked, warped, or missing shingles, loose seams and deteriorated flashings, excessive surface granules accumulating in the gutters or downspout, and other visible signs of roof problems. Indoors, look for cracked paint, discolored plasterboard, and peeling wallpaper as signs of damaged roof areas. Do you install roofs in the winter? Yes we do.Most Manufactures state that it is acceptable to install new roofing in the winter in certain conditions.Shingles usually do not seal together until its warmer out.We want our customers to feel total comfortable and it is not a problem to setup the install for warmer weather if needed.Please Contact us for more info. We use the New Roof No Mess System.This system is the use of the Equipter RB 4000 dumpster,This self propelled dumpster can lift up and over your landscaping.It also reaches up 12 feet high and 10 feet wide to insure that we catch the debris in the dumpster and not on top of your flowers!The Equipter has extra wide tires so it “floats” over your lawn without permanent damage. We also incorporate tarps and roll your yard using magnets to pick up any loose nails that we may have missed. What kind of labor warranty do i get? Yes, we do accept credit cards, however, due to processing fees incurred on our behalf, there will be a 3.25% fee added onto credit card payments on SOME transactions. Do you have an emergency repair service? So you install Metal roofing? Absolutely we do! We love installing metal roofs.There are many benefits of installing metal.From the long paint warrant to the energy stare benefits.There are sevral styles of metal roofing,the most common is Ribbed metal and Standing Seam.Please click here to learn more.